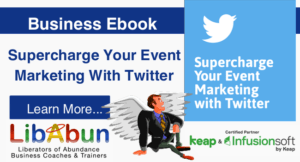 This Ebook – Supercharge Your Event Marketing Through Twitter, will help you discover the untapped potential that currently exists for all of your live and virtual events, and how you can use Twitter to drive awareness, increase attendance, and facilitate engagement for your next event. Instead of turning on the television, tuning into the radio, or opening the newspaper, audiences turn to search engines and social media for event information. Before registering for an event, people often search social channels to hear what others are saying about the event. Many people turn to Twitter for this information, since hashtags and advanced search capabilities make it easy to find conversations around any given topic. Event marketing used to consist of PR, direct mail, and traditional media including television, newspaper, and radio. While you can still have some success utilising those channels, it’s important to recognise that the way people consume media has drastically changed over the past decade. Social media and mobile technology have significantly impacted the way we search, discover, consume, and share information. According to a recent Pew Research study, 56% of all American adults own a smartphone. This means that over half of your audience has a computer in their pocket that can access the Internet and social media with the touch of a button. These two statistics will consistently grow as mobile technology exponentially improves, year after year.